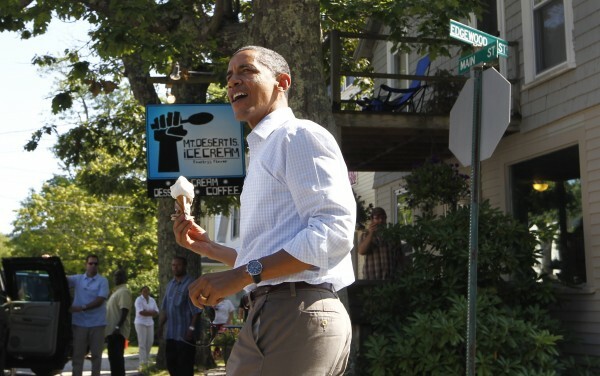 President Barack Obama holds a coconut ice cream cone after a visit to Mount Desert Island Ice Cream in Bar Harbor. BAR HARBOR, Maine — Food and Wine Magazine, one of the nation’s most prominent culinary periodicals, has just released its top 25 ice cream spots in the nation. Maine’s own locally owned and operated Mount Desert Island Ice Cream made the cut as one of the best. On Food and Wine’s website, MDI Ice Cream’s signature flavor is listed as Jack Daniels ice cream. “This already popular shop gained even more attention when President Obama and his family stopped in for cones at the Main Street location in July. (He ordered the coconut),” the online post reads. Aside from ice cream, Mount Desert Island Ice Cream also makes sorbets and cocktail mixes. founded in Bar Harbor in 2005 and opened its first retail store on 7 Firefly Lane, Bar Harbor in 2006. There also is a retail store at 325 Main St.